Hosting a reception for IMF’s “Article IV consultations” delegation in Hanoi on April 12, Hue affirmed that Vietnam consistently works to stabilise the macro-economy, accelerate economic restructuring, improves the business and investment climate and promotes global economic integration. The Vietnamese Government attaches much importance to the transparency of making and implementing economic policies as it helps enhance confidence of the investors and enterprises, making contributions to stabilising the macro-economy, he said. In that spirit, the Government will order competent ministries and branches to closely work with the IMF, hoping that IMF will give more support in training and policy consultancy to them, Hue stressed. 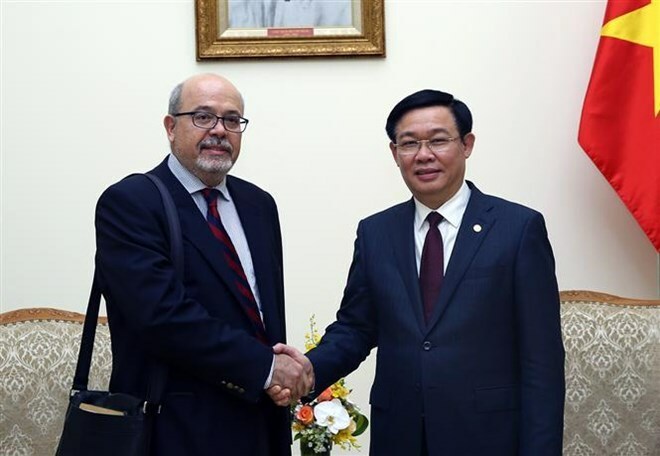 Alex Mourmouras, head of the IMF delegation, said the Vietnamese Government showed its commitments to stabilising the macro-economy and developing the private sector as a driver of economic development. Therefore, the Vietnamese economy has shown resilience and good growth with the inflation curbed at low rate in the context of increasing trade tension and global financial fluctuations, he said. The State Bank of Vietnam is actively carrying out the restructuring of commercial banks and credit operation while working to ensure growth. State budget deficit and public debt went down sharply over the past three years, he noted, saying these reflected that the Government’s policies are on the right track to make Vietnam become a real market economy. He referred to growing trade conflicts in the globe, together with unsteady macro stability, cyber security risks, and slow administrative reforms, as hindrances to Vietnam in 2019.